Mullery auctioneers is reporting significant demand with a strong pipeline of leads for high end homes in certain locations. Throughout this year the agent has experienced significant interest in high calibre homes, in many cases for properties in the €1 million to €2 million price bracket. To be favoured with instructions for any such property is an honour and Mullery auctioneers have been fortunate to have had several instructions of this nature during 2018. The agent was appointed to bring to market a remarkable modern two storey detached residence at Barna Gardens, which was presented to exacting standards by the vendors, with an exceptionally high degree of finish, high specification bespoke finishes throughout, offering architecturally designed, thoughtfully planned, and generously proportioned accommodation, situated on a secluded site, providing all the privacy any discerning purchaser would require. Boasting an idyllic setting adjacent to Barna Woods and Silverstrand and equidistant from Salthill and Barna with all conceivable services and amenities situated close by, including a choice of primary and post primary schools, shops, supermarkets, excellent restaurants, bars, and coffee shops, as well as Galway Golf Club and numerous sporting clubs and facilities. Mullery auctioneers sold this property earlier in 2018. In the latter part of the year, Mullery auctioneers was again favoured with instructions to market for sale a superb residence, situated on a glorious private site at Averarde, Taylor’s Hill, without doubt one of Galway’s finest residential properties, in a highly desirable location towards Taylors’s Hill lower, adjacent to The Crescent and within walking distance of the city centre and Salthill. 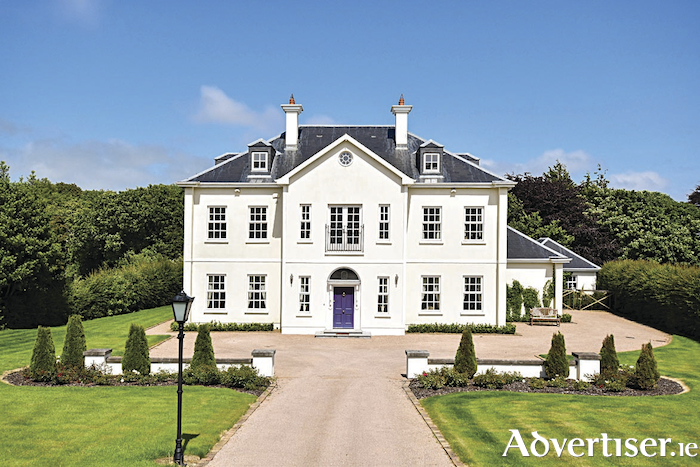 This impeccable imposing residence, set in glorious mature gardens on a large exclusive and private site enjoys a stunning location, tucked away off Taylor's Hill, close to numerous sporting clubs, including Galway Golf Club and Galway Lawn Tennis Club. The residence, which was originally built by O’Malley Construction for the vendors, had been very well maintained and presented in exquisite decorative order, offering accommodation extending to approximately 3,000sq feet, including inter connecting reception rooms, high ceilings, five bedrooms, and gardens enjoying complete privacy, bordered by brick walls and hedging, containing superb manicured lawns to the front and rear with a variety of mature trees and shrubs providing an abundance of colour. Some of the notable features of this property are without question its incredible site and gardens, location on Taylor’s Hill, in proximity to all requisite amenities, within walking distance of the city centre and Salthill as well as UHG and NUIG, a host of primary and post primary schools, as well as an abundance of shops, restaurants, coffee shops, and bars, on this truly enviable leafy and most desirable road. Mullery auctioneers sold the property in late 2018. The marketing plan for any property is crucial and the level of attention to detail and planning afforded to this prior to bringing the property to market and throughout the process is crucial. As we near 2019, a very important aspect of a marketing proposal is digital media, and the agent places an important emphasis on clients' properties reaching as many prospective purchasers as possible, so much so that all properties marketed by Mullery auctioneers feature on the Mullery auctioneers website, daft.ie, myhome.ie, and property.ie The agent's employment of professional photographers and virtual tour operators has proven very successful with positive feedback from users regarding their digital media experiences with the company, which also includes Facebook, LinkedIn, and Twitter. Mullery auctioneers is one of few family owned and operated auctioneering businesses in the city, with only the directors of the company involved in the management of the client relationship and all matters relating to each client's property, including dealing with inquiries, carrying out all viewings, and all related matters. For anyone contemplating selling a property, Mullery auctioneers currently has genuine interest for superior homes in locations specifically including Taylor’s Hill, The Crescent, Kingston, Fr Griffin Road, Salthill, and Barna, and would be delighted to hear from any prospective vendor to arrange an appointment to provide a property valuation and expert advice with recommendations on marketing the vendor's valuable property. Mullery auctioneers can be contacted on 091 567275, or contact Philip Mullery 086 8101024, [email protected]; Mike Mullery 087 6424106, [email protected]; or Michael Mullery 087 2541981, [email protected].